From struggling at school to ensuring the smooth supply of energy to a third of the UK's population, Patrick Clarke OBE is the personification of dedication and has been awarded an Honorary Doctorate in Engineering by London South Bank University (LSBU). Patrick Clarke was born in Jamaica and came to England at the age of eight. He found it difficult to adjust to life in a new country, and struggled badly at school. It was through the help of one of his teachers that Patrick realised success was a case of hard work. From school, he joined the London Electricity Board as an apprentice technical engineer, rising to become general manager of various subsidiary companies, each employing around 500 employees and with an annual turnover of £50 million. He enrolled on LSBU's MBA course, writing his dissertation on how to motivate and inspire people. The former struggling student graduated with Distinction. Patrick joined EDF Energy in 2000, as Head of Network Operations. Since 2011, he has been Executive Director of Network Operations, responsible for ensuring the smooth supply of energy to some 20 million people. The role has included delivering infrastructure projects for the 2012 Olympics, and managing the energy supply for historic events including the Royal Wedding and the Queen's Golden Jubilee. He became an OBE in 2012 in recognition of his career successes and his tireless work to encourage people from all backgrounds to raise their aspirations and achieve their potential. Patrick received his honorary doctorate at LSBU's graduation ceremony for students of Engineering, Science and The Built Environment, held at London's Royal Festival Hall. LSBU is one of the UK's top 20 institutions for engineering research, with the majority of the work rated as internationally excellent. 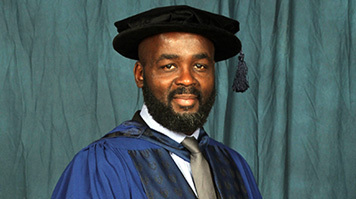 Upon receiving his award, Patrick commented: "I am delighted to receive this Honorary Doctor of Engineering. My hope is this amazing and unexpected award will inspire others to realise that everything is possible. I am inspired by a famous Nelson Mandela quote "It always seems impossible until it's done", and in all aspects of my life I aim to make a positive difference and leave an enduring legacy." LSBU Vice Chancellor Professor David Phoenix added: "We are delighted to confer on Patrick the title of Honorary Doctor of Engineering. Throughout his working life, Patrick has been driven by the desire to make a difference and to help others realise their potential. His message that dedication is the key to success – which his own remarkable achievements and his contribution to the community are testament to - is an inspiration to all."